I have been interested in teaching as a profession since college. But it was not until much later that I chose to teach high school and got my certification in chemistry and physics. Around the same time that I decided to teach high school, my wife and I began discussing the possibility of teaching overseas at a missionary school. My sister had taught at a missionary school in Vienna, and I felt like God might be calling Laura and I to do something similar. In 2010, everything came together for us to begin serving at Faith Academy: God provided us with generous and faithful ministry partners, and we finished up all of our pre-field training in time for the beginning of the 2010-2011 school year. In the past two years of teaching at Faith Academy, I felt a strong pull to continue serving as a teacher at Faith Academy long-term, which is why Laura and I are currently on furlough, increasing our financial partnership team, deepening friendships, seeing family, and preparing ourselves for long-term service. It has been the adventure of a lifetime, and it is only just beginning. I have been interested in overseas teaching and MK education since high school. After college, I taught for 8 years in public schools in the Chicago area. 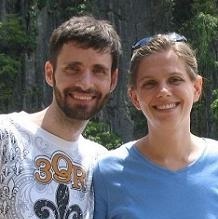 God brought Seth and me to Manila and Faith Academy in 2010. Since the birth of our first child in December 2012, I am teaching part-time while also learning how to be Mom. By teaching at Faith Academy, we support missionary families by providing an excellent education to their children, at an affordable cost; we also minister to the spiritual and emotional needs of students themselves. I teach middle school and high school. My subject areas are French, English, and Drama. My current classes are high-school French. My ministry is to my students– kids from many nations and many backgrounds. As a teacher, I get to help them grow academically, to listen to their hearts, to walk beside them during formative years, to be an example of faith lived out in real life, and to enjoy who they are and who they are becoming. That we will develop deep, long-lasting relationships with our ministry partners in the USA during this time of furlough. Currently, my primary request is for wisdom and growth in this new phase of my life– as I settle into being a mom and as I learn to balance that role with my ministry and work with students.